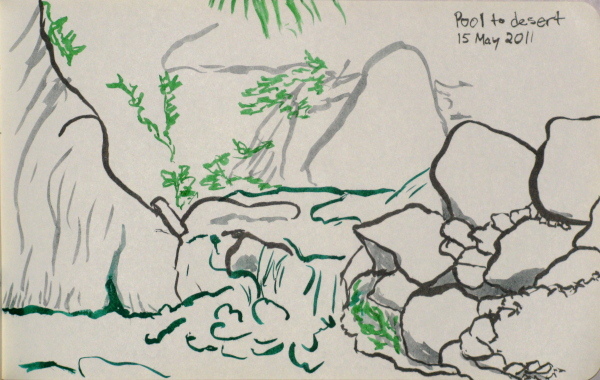 A small pool by the string of water that is so closely bordered by desert in Allison Gulch. 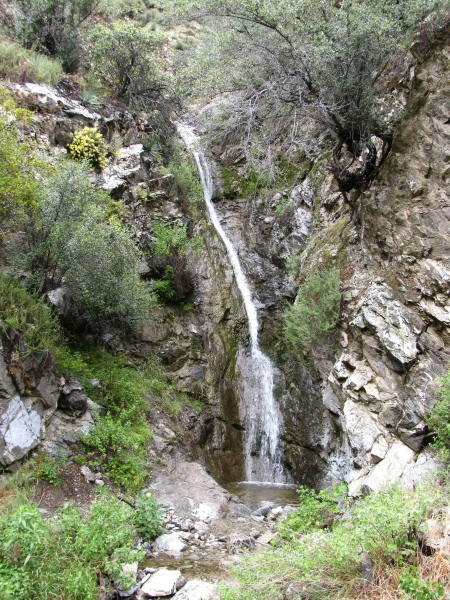 The waterfall up Allison Gulch. Some of the leftover construction from cabins in Fish Creek Canyon. Darling Donna, or so a sign is reported to have once said, flowing into Fish Creek soon. Oblique view of the main attraction up Fish Creek Canyon. Fish Creek Canyon has a quarry at the mouth, making access difficult. The quarry has a few access days somewhat less than every other Saturday during which they provide parking and shuttles to go up the canyon. This makes the hike up to the falls about 2 miles. The shuttles used to allow people up until noon and continued running them back down to 3 PM, but recently this time has been shortened. There is also a route made to bypass the quarry to get into the canyon from just after the gate to the quarry which adds about 3 miles to the trek up to the falls and which no one seems to have anything good to say about. Previous years when I have gone, the part of the bypass trail coming down to the canyon looked wide and used. The first mile of the other side, which I have been on, looked used, but was overgrown once it got to the other side of the canyon wall. 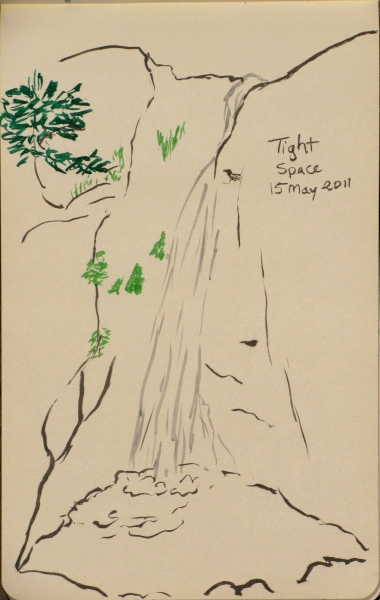 When I went this year (28 May 2011), the access trail down in the canyon was looking much less used and unmaintained. The quarry has now swapped some land east of the creek for land west of the creek and I'm not sure what this means for the access trail. Dan Simpson suggests that access can be arranged with the quarry, as well. 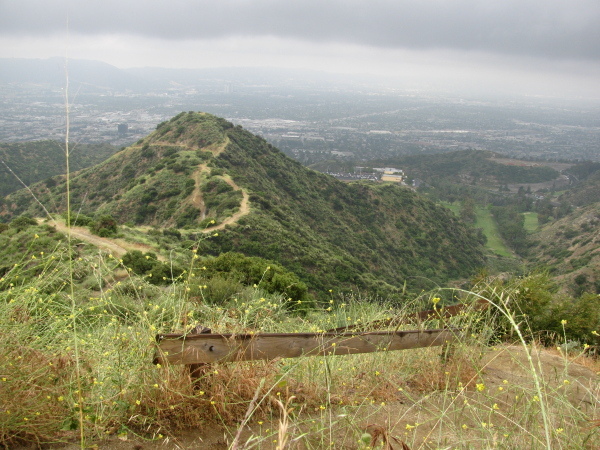 The Azusa quadrangle from 1953 (the first 7.5 minute for the area) shows a number of structures along the canyon past the cabin ruins that the trail passes through. These are probably more cabin ruins, but they are down in the canyon while the trail passes high. The northernmost is across the creek just as the trail drops down to the creek again and there was a fair amount of trail down to there. Fishermen like to fish in this area and downstream from there. Fishermen also fish at the very start of the trail and there is usually a use trail headed up stream where the trail first heads up the canyon wall. 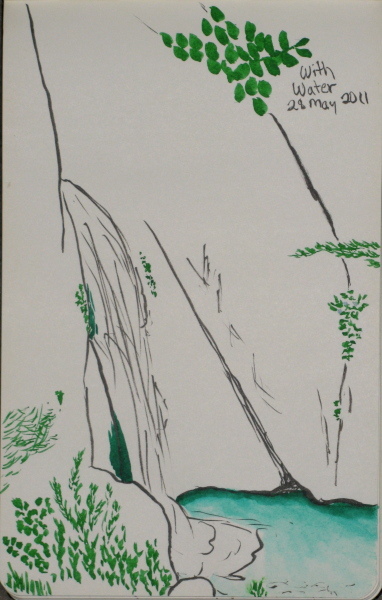 I believe the whole canyon is passable, except the actual falls, but could be wrong. People would clearly go to the top of the falls if they could find a way. There is a record of their attempts up what few pieces of dirt are near the falls, but everything ends in cliffs. That is not an area that can easily be climbed. However, there apparently has been a trail up to the top. 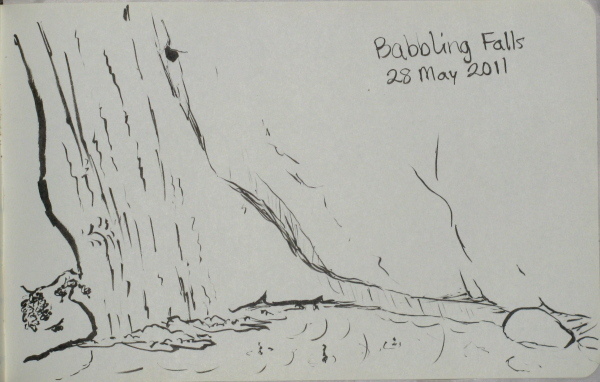 The Azusa quadrangle revised by the Forest Service in 1995 shows a trail leaving from just before the stream crossing and heading sharply up before traveling along just above the cliffs to arrive at the falls. I looked for this trail 28 May 2011, but could find no sign of it. Even before the trail crosses the stream, the west side of the canyon has become cliff. There is a promising spot just past the cliff section coming down the trail and just before the cute little falls (Darling Donna) that could be where such a trail would start. It is also possible someone was enthusiastic about a planned trail, but I don't think they're supposed to put anything not already there. Both Azusa quadrangles show a second trail leaving the main trail just after the stream crossing. This trail is traveling above the stream at the top of the waterfall so does not come to just above the waterfall, but does continue up the canyon quite a ways more than that. It is mostly above the canyon and stops when it comes down into a flat area. The oldest map shows three structures and trail along the creek all the way up to the truck trail above. (I gather this truck trail is distinct, but unmaintained and badly overgrown now.) It could make a nice overnight, I think, although maybe short for that. I also looked for this trail on 28 May 2011. I could see no sign of its couple of switchbacks going up the hillside. One section that looked more promising by the lay of the land was too overgrown to pass. Just past that, it was much more open, but most rock outcropping above that comes down to the trail and would require climbing. It may be possible to get around the rocks to the far north along the hillside. A use trail seemed to go up along the bottom edge of the ridge, so people may occasionally do this trail, in a rough way. I haven't gone up Fish Creek yet this year and the water around various places is clearly on the high side. The access days seem to be getting on the sparse side. I got up there right around 9 AM. It was particularly busy this time. People could have parked more tightly, but it was getting to be a bit ridiculous to find a space when I got there. A crowd was waiting for the shuttle vans. Once up there, it seemed the brush had encroached a bit more than usual and it was quite a crowd going both up and down to make the trail seem even smaller. I started poking around the old cabin spots, finding more behind the first set. The cabins were really packed in at one time. Although now all that is left is stone and metal and not much of that even. 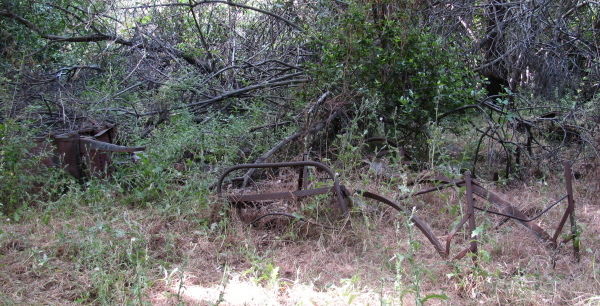 A bed frame sitting in the dead grass and a stove tucked away on its side in the brush. There are all sorts of known gold mines, and likely as many unknown ones, around the local counties. This is gold country, after all. Iron Mountain must have been a very attractive place to mine because it is riddled with the things even though it is (and was) a remote and difficult area. 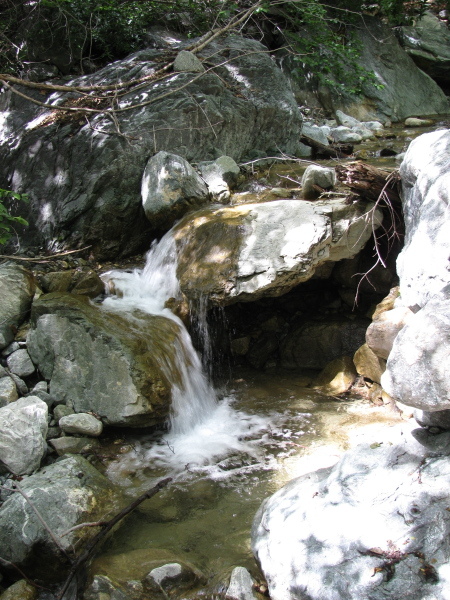 One still finds prospectors when going up the East Fork of the San Gabriel River at the bottom of the mountain. A lot can be found out about these mines from the local enthusiasts. Many of the mines around Iron Mountain are included in the "mines we will never see" section. There is also a section of lost mines of Iron Mountain. Some of these mines are more accessible than others. Stanley-Miller, Allison, Widco, Baldora, and maybe even Eagle and Gold Dollar may be reached by brutal day hikes from Heaton Flat. I've been thinking about longer routes to hit these. Less brutal, but really think light for the trip, no luxuries. Mileages are measured by string so can be up to 20% short, but are probably not more than 10% short. Heading out from Heaton Flat, it is about 4.6 mi (2500 ft gained) to a saddle. This is a junction with the old Allison Mine trail, a use trail to the top of Iron Mountain, and the trail down to the Coldwater Canyon which should be the biggest. Another 2.9 mi (500 ft lost) to where the trail (which is turns to old road about halfway along) turns back downstream and continues to a ranch. Where the road makes the turn is the start of the trails that have been removed from the new maps. It is 0.8 mi (540 ft up) to some buildings that are part of Widco Mine. The shafts and workings are up the side of the canyon a fair bit, the trail followed the bottom of the gulch, so likely indistinguishable from no trail. 0.2 mi further up the gulch is Baldora with some more workings. It looks like the easiest way up to Gold Dollar would actually be to follow this gulch further up and follow along spots where the contours aren't too close together until maybe even finding the old trail except for two things. One is that this is called "Dry Gulch", so there might actually be no water and it will be about time to camp when the mines are found. Another is this trip description by Prof. Brennen which has a secondary escape route that includes finding the Gold Dollar mine workings and says it is important to find the old trail. Otherwise, it would be about 1.5 mi, maybe a touch more for switchbacking up the slopes, and 2000 ft to get to Gold Dollar. Instead, after poking around the mine workings, should head back down the gulch to near the road again, so lose that 540 ft. Head up Coldwater Canyon a mile or so to get around a big bend where the canyon starts to get steeper and find a camping spot, about 0.9 mile (320 ft up). 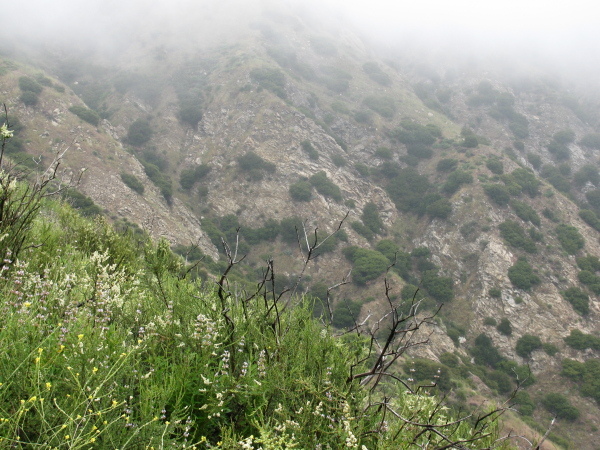 Next day, the rest of the way up Coldwater Canyon and try to find the trail up from there to the two mines. From the junction in Coldwater Canyon to the junction between trails to mines is 2.2 mi (2500 ft up total). It's another 0.45 mile (200 ft up) to Eagle Mine, and back down, then 1.3 (1200 ft up) to Gold Dollar. Then back to Coldwater Canyon for another night. Hike out the following morning. The first day might be a little long. At the saddle junction while hiking out, turn down the old trail to Allison Mine. The mine should have water and is thus a good camping spot. About 6 mi (fairly flat, not measured by me) along that trail. Next day, head down the old trail along the side into the gulch a mile or so below Allison Mine. You can't head down the gulch because there are waterfalls. There's probably enough time to go up to the lowest one from below once down in the gulch. Proceed down to the mouth of the gulch, right at the 3 mile mark for the bridge trail, and plunge into the river just to cross right back. Welcome to East Fork. Now that the boots are soaked, there's a nice long section with no need to cross, then two more and a possible wading along the side before getting to the lot again. After getting to Allison, there is another trail directly to Stanley-Miller, take this. This may be even harder to find than the one to Allison from the saddle and is a little longer (ish, downhill... maybe). The mine is not a good camp (no water), but it isn't too far above the river which offers ample water. The next day, in the Narrows, legendary section of East Fork. Look around! There is an old camp up there (might be camping at it). Eventually start the wade down. Look for old bits of road to reduce river crossings. There will be a trail up to the "bridge to nowhere", which should make some of the travel easier. Below the bridge is Horseshoe Mine. Further below the bridge are 2 river crossings before getting to the mouth of Allison Gulch and those described in the hike out for Allison. The longer the trip, the more chance for failure. This would be a really hard hike, don't be dead set on getting through the 5 day version and actually seeing all the mines and all the shafts that you can pick out from the hand drawn maps the mine enthusiasts have. If it gets too hard over the first days, it's just a matter of turning back, but heading off to Allison and Stanley-Miller is progressively more risky. This can't be done without good maps and good map skills. There's yucca up there. It seems to be called "sword bush" by folks who have tried the trail, and for good reason. It might not sound attractive with the possible heat, but jeans are your friend around yucca. Thick, thick jeans. Or maybe a machete. I'm not sure how effective they are on yucca. Some loppers might do the trick. Would certainly be a nice upper body workout. Parking requires an Adventure Pass or Golden Passport or America the Beautiful, which is what they call the Golden Passport now. Backcountry hiking and camping is dangerous, but this trip could be particularly dangerous. Also, people have reported mountain lions in the area. This is the second and last part. For the first part, go here. More little bits of stream along the way. 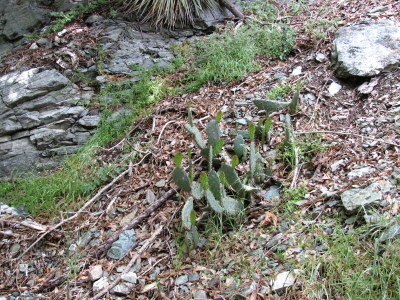 Just before a final narrowing, a cactus could be found on the slopes. There was also evidence of a trail leading up the side here which I decided against trying. I decided to go off to up Allison Gulch and maybe up to the mine above. I wasn't able to find others to come along, so decided climbing up out of the canyon along long gone trails would be a bad idea and it was already getting latish. I decided to just go to the falls on up the canyon. I got ahold of a permit for entering the wilderness. Didn't pay quite enough attention given the permit mostly filled out and thus had one saying I was going to the "bridge to nowhere". I was only starting off that way, but would turn off eventually. So I started down the road. The campground was full of emergency vehicles and it looked like search and rescue were doing exercises with a zipline over the river. They were all packed into bright yellow rain gear since it had been raining the night before and here it seemed to have lasted a little longer here. There were even a few drops falling now and then. 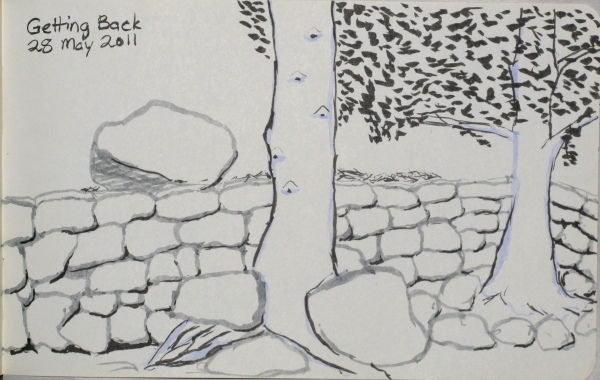 Then the road ended at a fallen bridge and the trail hugged along the edge. Along the side of the trail, a small tributary tumbles over some rocks to the river. No need to go so far for a falls. It was suggested that I might join with "Hike the Geek" type peoples. They were going up what they called "Stough Nature (backside)" at a time that seemed somewhat early for me these days, but it's getting to be summer so it seems much more reasonable at the moment. At least I thought it was getting to be summer. I woke up a bit early and heard a dribbling noise. Looking out, I saw there was a light rain falling and everything had gotten somewhat soaked. It probably would be much cooler than two days before, as predicted. I'd left my hat on the desk, so had to go off and get it although then I didn't use it. I was running on fumes, so had to find gas. A generally cheap station isn't that far, so went there but it wouldn't actually pump the gas and there was no one there to flip it on. The next one wouldn't read the card outside, but there was no one inside to take it. A fair bit down the way I finally found someone willing to sell me gas. Once up to the top, I didn't see the rusted sculpture described, so went all the way to the top of the hill where valets were parking cars. Figured that wasn't where I wanted to be, so asked them. They knew of a sculpture of a golfer a little down a side street, but it was bronze not rusted and I had a sense that no one would want to take note of it. I decided to go with the big parking lot at the end of the golf course, which seemed to work because I did find a bit of sculpture that looked more creative. Also needed creative parking to find a spot and on the second time through found one. Unfortunately, after all that, the group of people who seemed to be gathering near the start when I first pulled through had taken off. It wasn't too hard to figure out where the trail was, though, with all the trail signs with maps and the "You are entering a wilderness area..." signs. I started up it. It seemed a little steeper than is usual. It's also a little more single minded about direction than normal. It follows many tight little switchbacks lacing up the edge of sharp ridges from time to time. Once it dropped a few feet downward and for a bit it went flat, but then it was back to even more tight lacing switchbacks. The start of more switchbacks like shoe laces on the edge of the ridge looking back at the one length of flat and elevation loss. A use trail wraps to the other side of a small peak, maybe for a better view. A second trail meanders downward. 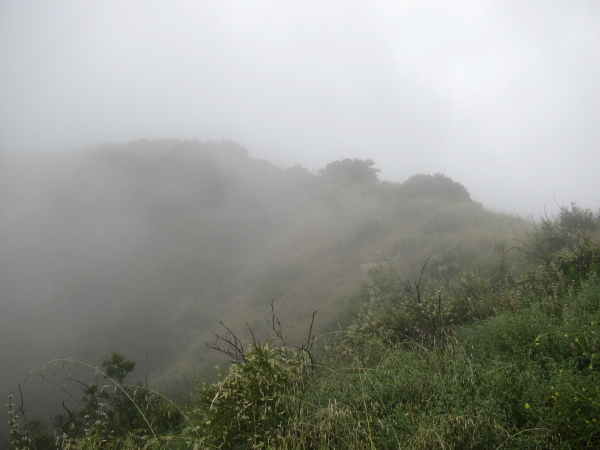 As I climbed further, I could see communication towers in the fog. This seemed like it was likely the destination. The fog thickened up as I went and this got harder to see as I got closer to it. Off to the north, there seemed to be a fairly steep and long slope, but there was really very little that could be seen. A fire had come through the area at some point not too many years ago and some bushes still bore the signs. A fork came up and I took the left. This section of trail had all its structures burned and unrepaired and significant water damage had occurred. Old fire damage and thick clouds behind quickly obscuring the vegetation beyond. Off to the right (south), the land wasn't quite so steep but still enough to have been difficult to navigate. The fog of the moment was a little more open to that side. For the moment. Similar burn damage in a small break in the moving fog. Reaching the top, I finally caught up with the likely group. It turned out there were, indeed, the geeks. They were also about ready to leave. The communication towers, sufficiently visible before for recognition, were now just a generally darker blob. 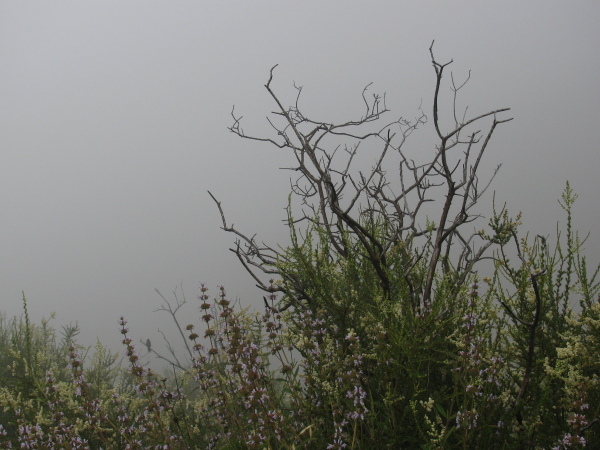 The immediate area was quite open in the fog, but it quickly closed in all around. Little could be seen downward. I took off a little bit after them and promptly stepped on a clean and slick with wet bit of wood for the trail. My foot didn't stop where I set it or after slipping about 1.5 feet along it. I caught myself with my hand on it badly and added a nice bruise almost at my back. Whatever was done to the thumb actually hurt more later on. Continuing down with more selective foot falls, I took the second bit of trail that went around the washout areas. It was smooth and not very steep at all and really very pleasant travel. It was also thinner with the high grasses crowding in since most people braved the trenches instead. A glimpse of the canyon to the south shows areas that are not as dense with vegetation. Coming to the first junction with trails to the road below, I took a bit more new route. This dropped quickly to trees below and a picnic area. Following the road was a pleasant, though harder surface, way back to the start.